The chest, the pectorals, the pecs. For many, the pecs are the ultimate muscle – the benchmark (no pun intended) – by which all great physiques are measured, first and foremost. Everyone has seen pictures of the golden days when Arnold exploded onto the bodybuilding scene with the biggest, thickest chest anybody had ever witnessed. 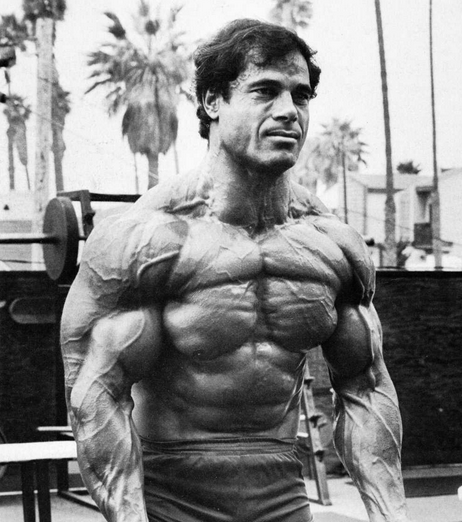 Alongside Arnold was the ‘little’ Franco Columbu (pictured below), who had a chest so cut and defined that nobody has ever bettered it in bodybuilding. Everybody has gawped at the sheer size and beefy thickness of the frontages on the likes of Dorian Yates and Ronnie Coleman. The pecs are the showpiece of your body because they sit out front for all to see. Therefore, your pecs have to be worthy of their position and they have to live up to the hype. Your pecs have to be trained hard and they have to be trained right in order for you to attain a chest to be proud of. The pectoral muscles are made up of the pectoralis major and the pectoralis minor. 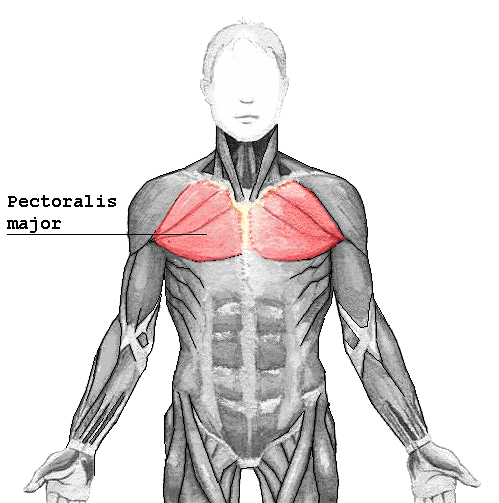 The pectoralis minor lies beneath the major muscle and is mainly a stabilizing muscle in the movement of the shoulder. There is no specific way to train this muscle nor any real benefit in doing so. Therefore, for the duration of this piece the term pecs shall refer to the pectoralis major: the large bulk of muscle that originates from the inner collarbone, sternum and lower rib cage, before inserting high onto the upper arm at the bicipital groove of the humerus bone. The primary function of the pecs is to move the upper arm toward the centre of the body, although it also functions to aid in rotating the arm as well as stabilizing other movements. Phew! Now that the science bit is done, how does that information relate to training? Well, it’s obvious that any movement bringing the upper arm forward and toward the centre line of the body will contract the chest. It is also plain to see from the diagram below that the pecs are large muscles and, therefore, will definitely benefit by being trained from a variety of angles. Note that the pecs can appear as two different muscles – upper and lower. The pecs actually benefit from being treated as separate muscle groups. The upper portion of the pecs – the clavicular pectoralis – is stimulated by a separate nerve. Chest training can give you the ultimate pump when done right. That feeling of your chest gorged with blood and sitting proud is about the best feeling you can get in the gym. Sheer Strength Labs NO2 Nitric Oxide boosters, combined with the insane Pre-Workout Powder, can really accentuate this great pump while creatine monohydrate can help you force that final rep or two. Training the pecs, like all other body parts, requires focus, dedication, intensity, good form, and a full range of motion. The mind-muscle connection should be employed to ensure that maximum effort is focused into the chest muscles. The concentric (lifting) phase of exercises should be performed powerfully, but in a controlled manner. The chest really benefits from a half to one second squeeze at peak contraction, as well as a slow, shredding eccentric (lowering) phase. Always take a deep breath as you lower the weight, followed by a forced exhale as you lift in order to help build and strengthen the small muscles between and around your rib cage. Form is essential when training the pecs as a huge amount of pressure is placed on the shoulder joints due to the large leverage employed by the exercises. Use a full range of motion if you want to build thickness right across the large pec muscles. So many gym layoffs, as well as permanent injuries and muscle tears, are caused by people bench pressing with bad form or lifting weights that are far too heavy. Chest day is definitely a day to leave your ego at the door. It is imperative that you don’t forget to take your Sheer Strength BCAA’s to make sure that your muscles are fully stocked before you begin a gruelling chest workout. BCAAs help protect the muscles from exercise induced breakdown. This helps you keep on the muscle that you worked so hard to put on. We may as well start with the good old push up. This is a great way to start off your chest training and warm up the shoulders. A variety of hand positions can be used – from the super narrow military style – to really wide positions and everything in between. Hands can be placed with fingers facing forwards or out to the side. Specialist stands and rotating handles can be used to add both greater depth to the exercise as well as a more complete contraction of the muscles. Place more emphasis onto the upper pecs by raising your feet up from the ground. Extra weight can be added by simply placing a disc across your back. One thing to strive for in press up form is to keep your back flat by imagining a straight line from your heels to your neck. Before warming up and burning your entire chest area with the trusty press up, let Sheer Strength Labs NO2 Nitric Oxide boosters and Pre-Workout Powder accentuate the gains in your entire chest area. Remember, creatine monohydrate will help you sustain your power over the press up. Each of these may have additional benefits that will help you with your lifting. Creatine will not only help your life more, but it will also help you have a more speedy recovery. In addition, the oxide booster and pre-workout powder may help you increase endurance. In order to best utilize them, it may be best to do some research on NO2 Nitiric Oxide, Pre-Workout Powder, and creatine monohydrate. Bench press is the daddy of all chest exercises and should constitute the core of your workout in some form. Similar in mechanics to the press up, the bench press can also be performed in a variety of different guises in order to hit all facets of the pecs. For many, the flat, barbell bench press is the mainstay of their chest routine. It is also one of the greatest causes of injury in the gym. Although most people can perform the barbell bench press with no issues whatsoever, it just isn’t suited for others. If you find the movement awkward or suffer from recurring shoulder niggles, the answer is simple, reach for the dumbbells. In fact, the dumbbell bench press allows for a greater range of motion at the top of the movement which permits a greater muscular contraction at the inner pecs. Dumbbells are excellent for hitting the inner part of the chest muscles and an inclined bench should be used to hit your upper chest effectively. Never bounce the bar off of your chest or catch and jerk the dumbbells at the bottom of the movement. Bouncing, catching, and jerking dumbbells is not only dangerous for your ribs and shoulder joints, but you are in fact cheating yourself of some muscular effort. The bench press is one of those huge compound exercises – like squats – that can raise your natural testosterone levels. These levels can be accentuated by using a testosterone booster like that available from Sheer Strength Labs. A testosterone booster can be used to maintain that fiery youthful energy and drive that college athletes use and love. Many older men are lacking this youthful energy in their lives, and testosterone boosters is one of the fastest ways to get it back. Flyes come in a multitude of forms, all of which are excellent for targeting the entire chest area and really getting a burn going. Always keep your arms slightly bent, but not to 90 degrees. If you need to bend your arms at a 90 degree angle, you are using a weight that is too heavy. For many, the flat bench dumbbell flye is second only to the flat bench press, however, it must be stressed that this is a movement that doesn’t feel natural for all people. The incline flye is a far more natural exercise and hits that often lacking upper chest target. Cable crossovers are simply a variation of the flye with the added advantage of being able to alter the angle easily. Cable crossovers allow you to squeeze the chest more completely by crossing the hands over at peak contraction. Pec-deck flyes fit in somewhere between dumbbell flyes and cable crossovers in terms of range of motion. Pec-deck flyes can be used by those with existing shoulder injuries because the movement is generally far more stable due to the mechanics of the machine. If you find that your triceps tire easily when you perform bench press, try using flyes first to pre-exhaust your pecs. This way they should fail first when you hit the bench. Flyes will raise your natural testosterone levels, so enhance this effect and your gains by using Sheer Strength Labs testosterone booster . In this case the testosterone booster, it will help keep on the gains and help keep off the nasty fat. This will help you get to the body you want with grueling work. Testosterone is the main male hormone and is also responsible for amore. Check out the supplement for yourself to see what effects will most help you. An often neglected exercise for the pecs is the dumbbell pullover (pictured below). Dumbbell pullovers are excellent for hitting the pecs from a totally different angle with an emphasis on the lower pecs. The mind-muscle connection should be fully implemented here to avoid much of the work being done by the lats. Puff your chest out nice and big before powerfully pulling the dumbbell above yourself. Slowly lower the dumbbell backward and feel the pecs stretch. Supplementing with Sheer Strength Labs creatine monohydrate can improve the gains you make performing dumbbell pullovers. The creatine can help you do more reps, and is the easiest and quickest way to drastically improving your gains. Check out the supplement to see what other instantaneous benefits you gain from using it. Maintain a steady routine that incorporates all of the exercises mentioned above in some form. Throw in the odd session of just pressing movements. Change up the order in which you perform these exercises. Start with pressing one week. The next week, pre-exhaust with flyes. Never neglect incline movements for the upper chest. Don’t forget to make use of supplements like the ones available from Sheer Strength Labs in order to give yourself that extra kick for gains in the gym. Using supplements is the fastest and most efficient way to give yourself the benefits of higher pumps, more gains, and more. The best part is they enhance your workouts by maximizing your intensity and reducing the time you need to rest in between workouts. The post Chest Training – How to Build Your Pecs appeared first on .